Having you upgrade to iOS 12? Since iOS 12 was released, an increasing number of Apple users upgrade their iPhone iPad to iOS 12, which is treated as the most important update ever for its wide range of supported devices and new progress of all aspects. But it's also suffered from users complaints on Music like home sharing music not available, simplified streaming service but omitted some regular buttons, playlists and music not syncing and so on. When it comes to this, it means you paid for iTunes, Apple Music etc., but it only supports limited functions like downloading music to iPhone XR/XS/Max, iPhone x/8/7/6s plus/6. What a pity! On this occasion, some turns to another free music downloader for iOS 12 to directly download music to iPhone SE/6s/6s plus, iPad Pro/Mini 4 etc., some still paid for iOS 12 music downloading. Whose side are you on? On my side, when the giving and gain are not equal, I'd like to go another way. So turning to another free music downloader for iOS 12 is the most likely choice for me cuz it's the most reliable and totally free at the same time. I have been using MacX YouTube Downloader for my free music download iOS 12 on iPhone iPad iPod. It always works well. Besides free downloading music to iPhone iPad iPod and Android devices from over 300+ online sites like YouTube, Facebook, Vevo, SoundCloud, Audiomack etc., it also enables me to add my downloaded music to iTunes which helps a lot to build iTunes music playlists, not to mention the fast downloading speed and lossless music quality. 1Free download this free music downloads for iPhone and launch it on your computer. Click "Add Links" to enter the iOS music downloading interface. Copy and paste music URL to the message box and click "analyze" to load details. Alternatively, you can also click "paste & analyze" button and the software will automatically detect the music details. 2Choose the music format (MP3, MP4, etc), resolution and file size that you desire for free music download iOS 12 for your iPhone XR/XS/X/8/7/SE/6S/6S Plus, iPad Pro/Air 2 etc. 3Click "Browse" button to specify an output folder on your computer to save the downloaded music on iPhone. Here you can add the downloaded music to iTunes by clicking "Auto add MP4s to iTunes" button beside "Browse"
4Hit "Download Now" to start free downloading music on iOS 12. Connect iPhone or iPad iPod with computer via USB cable. Turn off iTunes auto sync in case of data loss. Click "Music Manager" on the main interface. Select music files to copy and click "Sync" button. It can also work as iOS 12 music manager that lets you edit music playlists, artists, albums in batch and more, as well as transfer and convert DRM music files from iPhone to Mac. 1.As always pay for iTunes or Apple Music to make available offline. Though some nibs on music encountered when upgrade to iOS, the music APP such as iTunes or Apple Music is also deserved to subscribe if you have no specific needs like home sharing etc. To say the least, you can still ask for help from Apple to solve the small bug. In conclusion, music APP like iTunes or Apple Music is still the most popular way to download music to iPhone XR/XS/X/8/7/se/6s/6s plus, iPad Pro/Mini 4/Air 2 etc. as the problem will be fixed soon by Apple. If you cannot wait you can also downgrade iOS 12 to iOS 11.4 temporally or directly upgrade to iOS 12.x which may behave better on music playing. Online service music download site is also the common choice for the public since it's really convenient and easy to handle. Websites like Keepvid, Jamendo, BeeMP3, Freesound etc. are all good music base for free music downloading on iOS 12. You only need to copy and paste the music URL and analyze to download. But in this way, there is a high demand on the internet connection and a limitation of the latest music. Worse still, sometimes the online site could not analyze the music songs or corrupted in the process. This guide introduces top 6 ways to get free music downloads for iPhone (including iPhone XR/XS/XS Max). Plus, it shares the best free music download apps for iPhone as well as the top-rated sites available for you to download free music to iPhone. Solutions on free music downloads for iPad are listed, best free music downloader for iPad, top 10 sites to download MP3 songs on iPad, top 10 apps for free Hindi songs, Hollywood Disney movie soundtracks, hot singles free download on iPad. 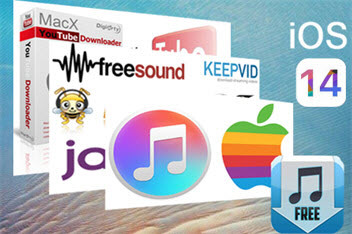 MacX YouTube Downloader is the best free iOS music downloader which can easily download music videos, mp3 songs with original quality and fast speed. This feature-rich video downloader also can help you download 8K/4K UHD full movie/videos/music free from other 300+ online sites.